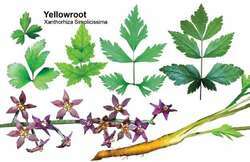 A small shrub with um... yellow roots and bark. Small drooping brown-purple flowers. Contains berberine, immune-stimulating antiinflammatory, anti-microbial, astringent. Supports liver- (jaundice, cirrhosis, bile, blood cleanser) Root tea used to help stomach, ulcers, menstrual disorders, diabetes, hypertension, cancer. uterine cramps.